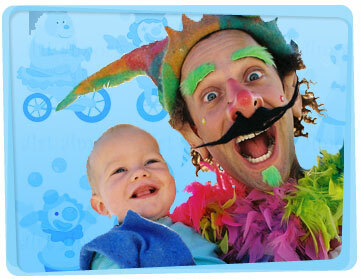 Wacky, wonderful clowns are waiting to wow the crowd at your next party! Children of all ages will adore our bright costumes and bewildering stunts and will be sure to come begging for more! 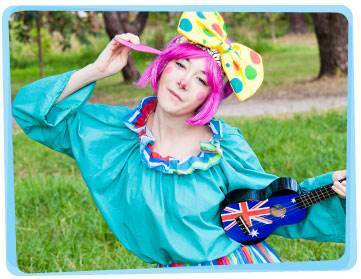 Whether you want to hire a clown for a kids birthday party or another event, Yabadoo has the best party clowns for hire in Melbourne. Our kids party clowns will have the children’s cheeks aching from excessive giggling during our comedy magic show where almost every child wants to be a volunteer. Our kids clowns in Melbourne will also entertain your children with face painting, games (including pass the parcel), a treasure hunt, balloon sculpting and lots more. Your birthday party entertainer will create and present a specially crafted balloon to the birthday child during the magic show. Built on almost 20 years of experience, our clowns for hire in Melbourne have brought happiness and delight to thousands of kids with our children’s birthday parties, christenings, roving performers, stage magic shows, council events and other occasions. Looking for clown party decoration ideas that are both functional and decorative? Clown parties are incredibly fun to have. 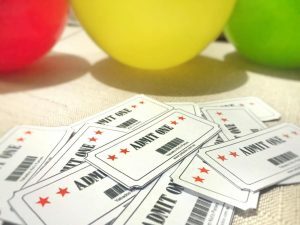 To help you out, we have included a link to a free ticket template you can print out for your party. Include a ticket in the invitation. This will serve as their entrance pass in the party. Give the kids several tickets upon arriving at the party. Let them use one ticket per game. As a variation, give them a silly task to do if they run out of tickets. The more difficult the task is, the more tickets they receive. Use it as a pass for the magic show. Do you need more clown party decorations? Call Discount Kings Party Supplies at (03) 8358 4590 to ask if they have available stocks! Visit them at 1/1099 Western Hwy, Ravenhall VIC 3023 to see more clown party supplies.